Gary Cahill is at the moment, one of the best centre-backs in the world. He plays for the English national team as well as the English Premiership side, Chelsea F. C. for which he has been appointed captainship since John Terry left the club. Thanks to his influence in both country and club, he was called up to play in the 2018 FIFA World Cup for England. Here is all to know about him. It was in the North East Derbyshire town of Dronfield, England that the no-nonsense defender was born on 19 December 1985. Even though he is British, he also has Irish descent, thanks to his grandparents. He was brought up by his parents. Since he was a child, Cahill had always loved football and he supported the Sheffield Wednesday. Because of how much he was interested in playing football, he got to join his first club when he was just 15 and since then, there has been no turning back for him. Before deciding on playing professional football, Cahill has got some education from the Dronfield Henry Fanshawe School. He moved on to play football from there. Gary Cahill’s parents are Hughie Cahill and Janet Cahill. They brought up their son Gary alongside a daughter, Paula Cahill who is two years older than her brother. Interestingly, the parents and sister of the player all prefer to stay away from any media attention as such there is not much that is known about them. 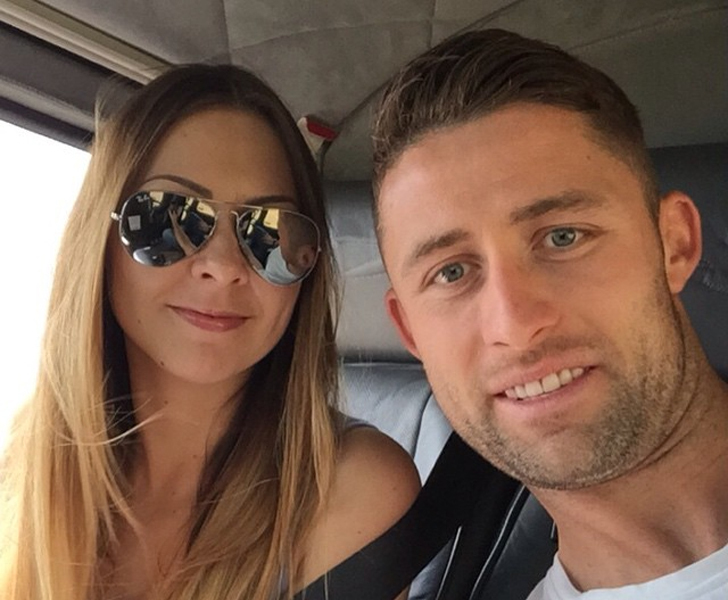 As regards his personal relationships, Cahill has been married since 2013, his wife is Gemma Acton. Before they tied the knot at Brookfield Manor, Hathersage, the English defender and Gemma dated for a long time. Like most things about Cahill, his family is kept away from the public but it is known that he has 2 kids with his wife; Leo Cahill and Freya Cahill. Even though it is with Chelsea F.C. that the skipper got to make a name for himself, he has walked a long way since he began playing his youth football with AFC Dronfield which he left in 2000 to join Aston Villa. By 2004, he had already begun his senior career with the same team, but he was later sent on loan to Burnley, playing until 2005. His next move was on loan to the club he has supported as a child, Sheffield United for which he played from 2007 to 2008. After his loan ended, the centre-back was sold to Bolton Wanderers. After playing 130 games and netting 13 goals, Cahil made his big move from Bolton to Chelsea in 2012 for a fee that is put at close to £7 million. By the end of the 2017/2018 season in which he led the Blues to win the FA Cup against Manchester United, he had already played 189 games for the club, scoring 13. With Chelsea, the aggressive defender has won many trophies including the UEFA Champions League, UEFA Europa League, and 2 English Premier League titles. He has also won the FA Cup, 3 FA Community Shield trophies, and was runner-up for the FIFA Club World Cup. With Bolton Wanderers, he won the Players’ Player of the Year in 2009. For the England Team, Gary Cahill first wore the jersey in 2004 when he played for the under-20 team. In 2007, he gained promotion to play for the under-21 team, and by 2010, he was given the big call to wear the colours of the nation with the senior team. He has played for the senior team at the UEFA Euro 2012 as well as the 2014 FIFA World Cup in which the team did not get to make it beyond the group stages. Before the defender got called to play in the 2018 FIFA World Cup, he had already played 58 games for the country, scoring 4 goals in the process. At the tournament in which the Three Lions ended in fourth place, Gary only got to play a game in the group stage against Belgium. In the game, the Lions went down to the Red Devils by a goal to nil, only to bow again by 2 goals no nothing in the third-place play-offs. Apart from the fact that he is a very skilful player, there is no denying that as a defender, Cahill has always made use of his body to have his way around on the pitch. That stated, he has a good athletic build which complements his skills. The professional footballer has a height of 6 ft. 5 in (193 cm) which he uses well as a defender and a body weight of 190 lbs (86 kg). His overall body measurements have not been given but as noted, he has an athletic build.